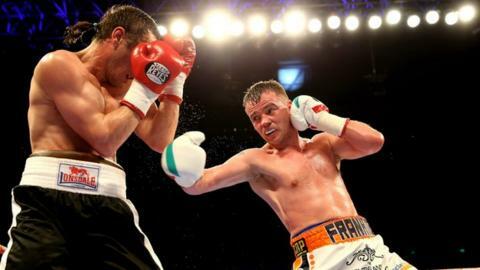 Birmingham boxer Frankie Gavin has had to postpone his forthcoming fight with fellow Midlander Sam Eggington after having his foot run over by a car. The 30-year-old former world amateur champion hoped to win back his British and Commonwealth welterweight titles on 17 October at Birmingham's NIA. But he revealed on Twitter: "Sorry to say I have had to pull out of my fight. "I got ran over two-and-a-half weeks ago. Thinking it would heal, but it hasn't so I have had to pull out." He added: "I was stepping off the kerb in Aston two weeks ago. The driver did stop. There's nothing broken, but it is badly bruised. I've had injections, but couldn't train properly. I couldn't run on it. "Hopefully, the fight can happen again some stage in the future. I hope to be back in the ring sometime in November/December." Southpaw Gavin has not fought since he was stopped in the sixth round by Kell Brook when challenging for the IBF welterweight title in May.